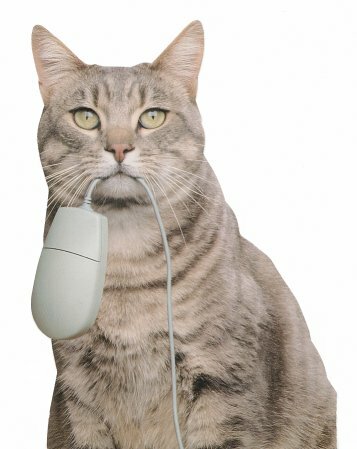 The computer mouse may be an endangered species. Instead of rolling a mouse around to move a cursor around on the screen, more and more users will gesture with their fingers on touch screens and multi-touch trackpads, analysts say. Or they will tilt or shake the phones or other handheld devices themselves to manipulate them, said Steve Prentice, vice president and fellow at Gartner, a market-research firm based in Stamford, Conn.
Apple's iPhone, Nokia and other smart phones are already undergoing such a transformation with touch screens, he said in an e-mail, and the switch "will accelerate over the next two to three years." Already, Hewlett-Packard makes a TouchSmart personal computer with a touch-screen monitor. Apple's new laptop computers have trackpads that support gestures with two, three or four fingers. And the upcoming Microsoft Windows 7 will also support multi-touch. What do you think of that? Would you prefer a touch screen to a mouse? Do you think that people who have used computer mice all these years will be amenable to a new system of moving about a monitor? I hate the touchpad on my laptop. I tried to use it for several months but eventually went out and bought a mouse for it. I don't see me ever using anything besides a mouse (or mouselike device, such as a trackball) for a long time. I don't mind the touchpad on my iPhone, but I'm not spending upwards of 2 hours a day using it either. Oooo . . . there's a wonderful idea, shaking your electronic equipment. Yeah . . . that'll hold up well. I'm sure manufacturers love the idea that you will be routinely replacing equipment which no longer functions because you've shaken the bejesus out of it. I suspect we'll adapt to whatever. The problem with touch screens for desktop use in the corporate world are many. 1. You end up with a lot of fingerprints on your screen. 2. It's awkward, inconvenient, and not very ergonomic to have to touch the screen to do everything. Much faster to have a hand on the mouse to get around the screen. 3. A touch screen isn't as precise as a mouse for detail work unless you are using a stylus. 4. To overcome 2, the screen would need to be the keyboard. Hard to share your screen with a coworker at that point. Touch screens are useful in some instances and could be a nice option but they will never completely replace some version of the keyboard and mouse for a desktop just as voice command driven interfaces will never be the only computer input device for offices. For me at least, a touch screen is no replacement for a mouse. My suspicion is that this article is completely wrong... and that you will see mouses around until something better than touch screen comes along. My dream input device would be eye tracking... where the cursor will move to the point in the screen you are focusing on. Touch screens are great for a lot of stuff, but if you have to do any details pointing (for graphics and such) then pointer technology works better. I agree completely. Touchscreens actually aren't new. At all. I remember going to the computer lab in elementary school, to a lab of green and black screened macs. One of the computers there had a touchscreen device attached to it. (And playing Oregon Trail on the touchscreen was the coolest!) This had to have been somewhere between 1990 and 1993. If touchscreens were going to replace mice, they would have done it by now. I agree with most here what they're saying on the subject that the mouse device will not totally be replaced. I've used a laser-type mouse for years now, having gotten rid of the ones with a silly ball in the bottom that get dirty. Parados hit the nail on the head with the fingerprints on the screen, etc. One has to be very careful cleaning the new LCD monitor screens. They can be easily damaged if not cleaned in a proper fashion. I'd still use mostly keyboard shortcuts like I do now. Having to remove my hands from the keyboard to reach for the mouse and click on something and then reposition them back on the keyboard again is a severe degradation in productivity. For simple surfing, my ideal interface would be a wireless stylus. I had one of the early models and it didn't consistently work all that well so I'm waiting for them to be perfected. I learned a few keyboard shortcuts early on, and that was it. I really ought to study more of them, 'cause they ARE useful. I used keyboard (shortcuts? dunno if there were any other modes back then) when I used a old sanyo pc and wordstar. A thick book came with that.. But haven't used them since I got my first mac. On the other hand, I may try them, learn some new tricks. I like my optical mouse. If I ever do learn CADD, or cad, or landcadd, or whatever it's called now (the cost of the program being in my way, I haven't researched it the program itself lately), I'm sure I'd appreciate a better stylus than my index finger. Depends. On a phone, yes. On a computer I'd rather use a mouse in most cases. Reaching up to touch the screen in a desktop setup would be a pain. Now if it's a tablet laptop that might make sense, but these would be cases of touch screens taking over areas where a mouse is already inconvenient (mobile computing). I've used a mouse on a phone (bluetooth mouse on Windows Mobile), it's inconvenient. I've played with a touchscreen desktop, the touchscreen is cool but rarely useful and even while playing with it my arm got tired of reaching for the screen. When I bought a new HP, I had to use the touchpad. I didn't have any idea of what I was doing and no instruction manual was available. I fooled with the touchpad, and finally did enough damage that the computer (laptop) shut down. So for the next 4-5 hours I talked to a technical problems woman in India . She finally got the computer running. I own an IBM that has a mouse in the center of the computer, so when I change computers, I basically have to re-program my brain and my fingers. When I got my first laptop (2003), I struggled and struggled with the built in mouse. My daughter observing this suggested I get a real mouse? You can do that? said I. I used a plug in mouse for years and now carry a wireless mouse in my computer pack and rarely use the built in mouse for anything. I'm not techy enough to use many keyboard shortcuts though I occasionally activate one unintentionally. The mouse is efficient enough for the kinds of computer tasks that I do. I can't imagine being as productive doing what I do using a touchscreen. Question: When I have the little insert thingy in my new Sony Vaio that is necessary for the wireless mouse to work, the screen saver won't come on as scheduled. Is there any way to remedy that? Looks like the consensus here is that the reports of the death of the mouse are greatly exaggerated. But different strokes for different folks. For example, my wife is perfectly happy with the touchpad on her laptop and bridles at any suggestion that she get a standard plug-in mouse for it. For myself, on the other hand, if I got a laptop a mouse would be the very first accessory I'd get for it. Any time I've used a laptop w/o a mouse, I've gone stark raving crazy. As for touch-screen technology, it's all right if all you want to do is retreive data. For nything else, e.g. inputting your own data, it's not really recommended. "Depends. On a phone, yes. On a computer I'd rather use a mouse in most cases. Reaching up to touch the screen in a desktop setup would be a pain." I shudder to think of the problems that would complicate my computing life if I used a touch pad. And I certainly wouldn't want to use a touch screen that everyone and his brother had been poking at with donut-greasy fingers. Back when I did a lot of spreadsheet work and document editing, it was all mouse and tons of keyboard shortcuts. After a while I started programming my own shortcuts, as well. The only thing I've ever seen touchpads used for (in a full-size format -- phones and the like are a different beast entirely) was in a presentation-and-notes setting, where people were using a stylus to scribble notes and diagrams directly on the screen of power point or reader slides during lecture. When I take notes, they tend to be very visual and kinetic, and a touchpad would be great for that. Not a part of my life any more, though, so not a temptation. youre an idiot. check out the new technology. like say an i phone. you shake it to play games. its not a baby and you are not a british nanny.... its okay. step into the future.